Monday, 1 August, 2016 as at 6:00a.m. The National Meteorological Service and the National Emergency Management Organization (NEMO) continue to monitor showers and thunderstorms associated with a strong and fast-moving tropical wave in the eastern Caribbean . The wave which is some 900 miles east of Belize is moving at 20-25 miles per hour and it is currently showing signs of strengthening. It has 70% chance of becoming a Tropical Depression or Tropical Storm. It is likely to continue strengthening and is expected to start influencing our area by late Tuesday /early Wed morning. NEMO District Emergency Committees have been meeting and will continue their meeting today. 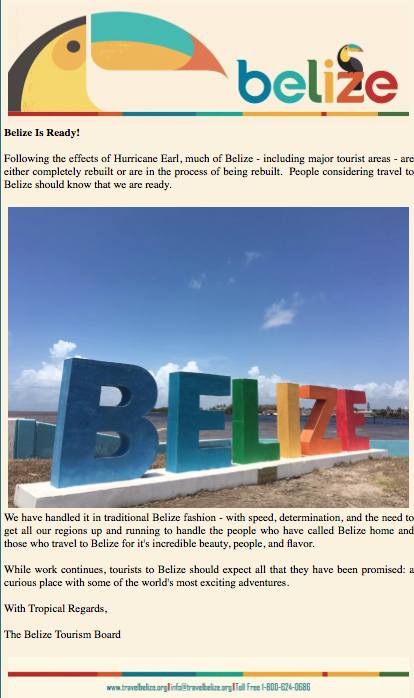 The Belize District Coordinator has been attached to the San Pedro Emergency Committee. CEMO is preparing Shelters and making arrangements for the buses in the event of a NEMO organized evacuation. Public Officers are being placed on notice to be prepared for their emergency duties. NEMO warehouses continue to receive supplies. NEMO continues to advise people on the cayes who wish to seek shelter on the mainland need to pay close attention to NEMO advisories. People living in areas that are prone to flood are asked to stay alert. The local authorities and residents are advised to clear drains likely to cause flooding. All persons particularly people living on the cayes, in flood prone areas, fisher folks, and farmers are advised to monitor this tropical wave and to be prepared to take the necessary precautions. Corozal, Mr. Williard Levy at 623 0237; Orange Walk, Ms. Suliema Celiz at 605 5046, Northern Regional Coordinator, Mr. Aragon at 6152264; Belize District, Mr. Lionel Tillett at 630 4830 and Mr. Kevin Pollard at 621 2275; San Pedro, Ms. Timrose Augustine at 600 8672; Belmopan, Ms. Clare Moody at 630 9791; Cayo, Mr. Al Westby at 630 3224; Stann Creek, Mr. Victor Castillo at 630 9780; Toledo, Mr. Kenton Parham at 630 9787 and the Southern Regional Coordinator, Mr. Keith Emmanuel at 6309711. The NEMO Emergency Hotline is 936. NEMO continues to monitor the situation. All District Emergency Committees have been activated. 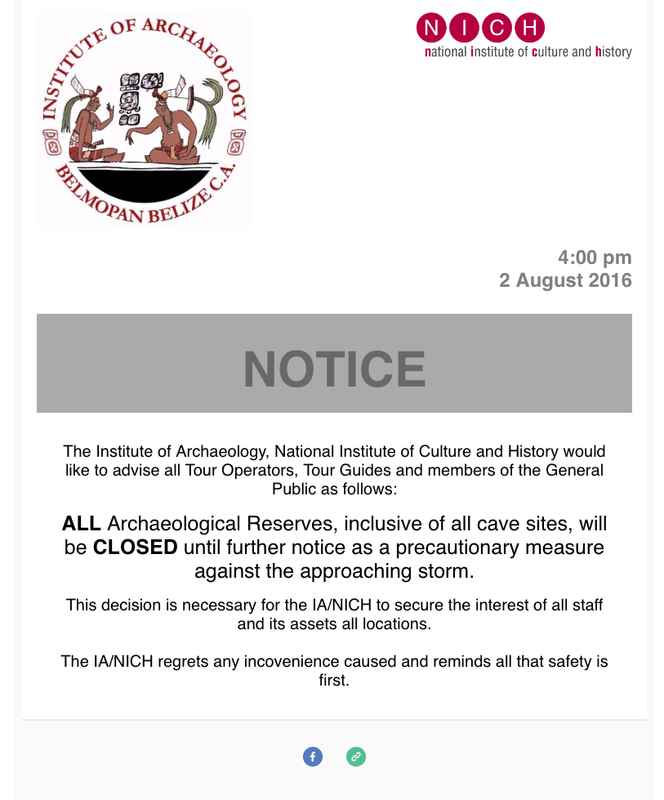 Stay alert and be prepared! Do not listen rumours! Heed advice from the Met Service and NEMO. STRONG TROPICAL WAVE APPROACHING THE CENTRAL CARIBBEAN BECOMING BETTER ORGANIZED. The National Emergency Management Organization hereby informs that the strong, fast moving tropical wave approaching the central Caribbean is now much better organized. The system is likely to become a tropical depression or storm within the next six to twelve hours. The tropical wave is likely to continue to move in a westward direction at about 20 to 25 miles per hour. This places Belize in its path. Conditions are expected to deteriorate in Belize around late Tuesday night into Wednesday morning with the system crossing the mainland during Wednesday night. If the system remains a tropical storm we can expect winds within the range of 50 to 60 miles per hour. Rainfall estimates are expected to be between 4-6 inches. 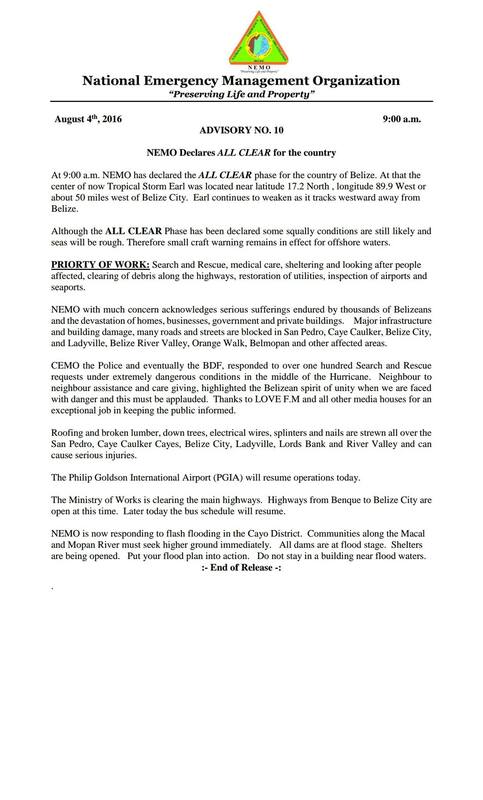 NEMO advises the public to remain calm. Any further development will be shared in an update. Evacuation planning is in place to receive people from the cayes. The National Executive Committee will meet tomorrow at 7 a.m. to review the situation and decide if there is a need for an evacuation. The Department of Transport has notified key Bus operators to be prepared to assist with an evacuation once the decision is taken. Boat operators met today with the San Pedro Emergency Committee and are standing by. CEMO is making preparations to receive and transport people from the cayes to Belmopan and further west if necessary. Shelters are being prepared but remain closed at this time. NEMO hereby advises, people on the cayes who feel it safe to leave the islands to do so on their own as a precaution for their safety. If you live in a flood prone area and along the coast you are strongly advised to move early. Residents and local authorities within their means, are strongly encouraged to clear drains to reduce the risk of flooding, to trim trees etc., and to secure their families and homes. Corozal, Mr. Williard Levy at 6230237; Orange Walk, Ms. Suliema Celiz at 605 5046, Northern Regional Coordinator, Mr. Aragon at 6152264; Belize District, Mr. Lionel Tillett at 630 4830 and Mr. Kevin Pollard at 621 2275; San Pedro, Ms. Timrose Augustine at 600 8672; Belmopan, Ms. Clare Moody at 630 9791; Cayo, Mr. Al Westby at 630 3224; Stann Creek, Mr. Victor Castillo at 630 9780; Toledo, Mr. Kenton Parham at 6309787 and the Southern Regional Coordinator, Mr. Keith Emmanuel at 6309711. The NEMO Emergency Hotline is 936. NEMO is activated countrywide. Stay alert and be prepared! Do not listen to rumours! Continue to heed the advice from the Met Service and NEMO.